Piso Fare 2019 Promos Until 2020: New Logo of Cebu Pacific with a new PROMO for 2016! 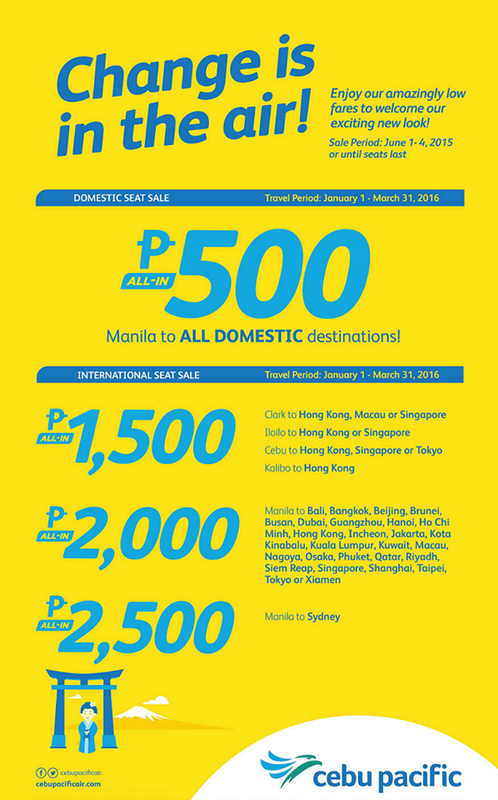 New Logo of Cebu Pacific with a new PROMO for 2016! Piso Fare Promo 2016: Change is in the air! Cebu Pacific has changed it's new logo. With that, thy are giving in an ALL-IN P500 promo in all it's domestic destinations based from Manila! Mind the travel dates too! This promo is until March 2016! Isn't that amazing? Prepare now and have a blast on your future travels! Cebu Pacific’s newest colors are inspired by our beautiful country’s natural canvas – its sky, land, sea and sun. We will roll this out in stages, so watch out for more on this page! Is this promo still available?? Here you can find easy to follow tips on how to come up with a good logo design. Here are some logo design ideas for you to consider. Piso Fare For May 2015, No?